This rule is based on what all good photographers know … it takes a lot of pictures to get the right one. In this day of digital cameras the excuse of running out of film is gone, so take a LOT of pictures. Try different framings of the same room. Hold the camera up high without looking through it. Hold the camera down low without looking through it. Take a picture of the same room from all four corners. If you take a LOT of pictures you really improve your chances of success. And it goes with out saying … make sure to save your photos into a “property folder” before you erase. The Property Sign Rider ensures visitors can view the property day or night. Once you sign up for ListingsMagic's Marketing System and build your lead generating tour and you can get your property ID or the Single property Website address place on a sign rider. Or take it one step further and register the actual address as the Websites address and place it on the sign rider. 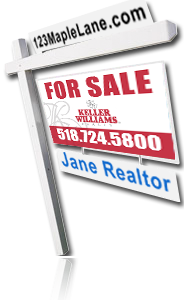 These rider signs are a great way to stand out in your community and get those drive by buyers visiting your listings Single Property website.The rider is also a great way to remind your seller of all the exposure their property is getting on the Internet. The rider signes are $34.95 and include shipping and handling. Once ordered your rider signs will be shipped directly to you. You can purchase a unique property domain name (www.123MapleLane.com) and have that address open up your Single Property Website. ListingsMagic will automatically take the domain name that you select and provide hosting for one full year. The Domain Purchase price with site hosting is $19.95 a year. What used to take hours can now be accomplished in minutes.